-According to some Internet-sources the official designation of San Marino between 301 and 1243 was successively "Land of San Marino" and "free City of San Marino". Can you give me the long-form names in local language and the exact dates/years of the use of these names? - After 1243 San Marino was officially styled as: "Most Serene Republic of San Marino", according to most historical documents (for instance: de Political Handbook of the World). But the coins of San Marino just mentioned "Repubblica di San Marino". Does this mean, that both names are equally used as official names for the polity. Or does it means that "Repubblica di San Marino" was used later on (can you give me the exact date) besides or in stead of the "Most Serene Rep. of San Marino". Or was the term used only in semi-official usage? Land of San Marino: Terra di San Marino. Free City of San Marino: Cittá Libera di San Marino. I think that the "Most Serene Republic of San Marino" is just a grand title. As far as I know, San Marino has always been Republic of San Marino, at least since 1815. The actual denomination is "Serenissima Repubblica di San Marino", where "Serenissima" is the Italian for "The most serene" (better, in this case it means "The very serene"); the adjective has been historically used for the Republic of Venice, in facts "La Serenissima" in Italy is used to indicate Venice or its old Republic. No official shades have been issued with regard to either the stripes or the arms, and no recommendations for the arms are given in any official source. However, the UK Flag Institute give Process Blue, BR20 PMS 549 and the Album des Pavillons PMS 292C for the stripe. As stated in W. Smith's "F&AATW" by government and army forces is used the white-blue flag with state's coat of arms. As I read the signs there is a few variants of the appearance of the arms. Also it is stated that the flag is a 'de facto' flag, used without the legal background. The flag of the Republic of San Marino is defined by the graphical model that forms the appendix A of the present law. The official arms of the Republic of San Marino is defined by the graphical model that forms the appendix B of the present law. The usage of the official arms is regulated by ordinary law. The regulation of the usage of the flag is assigned to executive order. The present law comes into force the 15th day following its legal publication. The official flag can assume the proportion 2:3 for international uses and/or when specifically envisaged. At a proportion of 2:3 the arms will occupy the central third of the length and the line that passes through the intersection of the arms of the cross of the crown will be at 1/6 of the height from the upper edge. According to Album 2000 [pay00] - this is the alternative civil flag (C--/C-- (3:4)). Regarding the civil flag (and ensign), has anyone ever seen a ship (boat, yacht whatever) registered in San Marino? Was this flag confirmed in use on sea in modern time? My name is Martin Grund from Germany. I am the initiator of the world's first penguin webcam in the Antarctic. 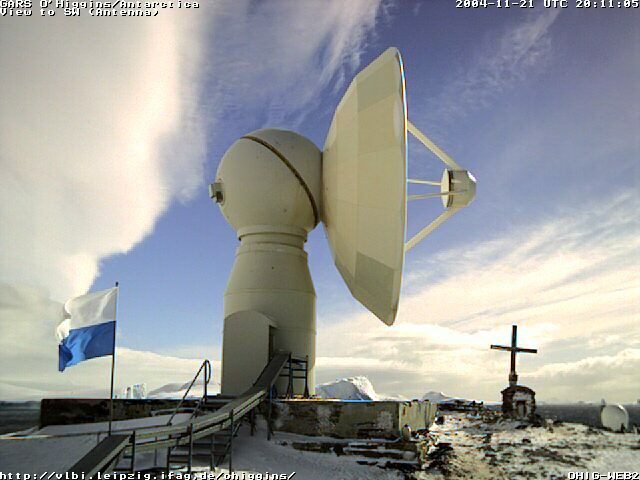 At the moment there is a scientist from San Marino working in the German Antarctic Research Station Bernado O'Higgins and you can see the civil flag of San Marino in the photo of one of the station's webcams. Here a photo from our archive at www.pinguincam-online.de (no longer active). The flag you mention has been reported as the Merchant Ensign of San Marino by various sources (see National Geographic for example). Unfortunately no evidence exists that this flag actually existed. San Marino, for those who did not have a chance to visit it, is on a mountain with no direct access to any sea, even if the Adriatic Sea is close to it. The October 1917 National Geographic [geo17] states: Figure 815: "The merchant flag of San Marino, which, though that of a belligerent, the little republic having dared to declare war against the Central Powers, has probably never yet been encountered by a German submarine because, as may well be imagined, the merchant navy of the mountain republic is not large." The Declaration of Barcelona, 20th April 1921 recognised the right of states with no littoral to fly their own flag at sea. Description in Pedersen's "Moussault's Lexicon Vlaggen en Wapens", 1980: "In its present the CoA dates from 6 Apr 1862. Even though San Marino was always a republic, it has a crown on top of it as a sign of sovereignty. The three white towers, crowned by a ostrich feather, remind of three castles on three mountain tops of the Titano Mountains. The coat of arms dates at least from the 14th century. Around is wreath of oak and laurel. Motto: Libertas - Liberty." Nathan Lamm asked: If it's a republic, why is there a crown on the seal? This is surely among the oldest republics to do so, but a number of other republics in the region did (and some still do) the same. The crown is here symbol of sovereignty and independence rather then the hereditary monarchy. Some examples that come to mind include Republic of Ragusa (Dubrovnik, on this side of Adriatic), and in modern age both Austrian republic(s) and even more modern Hungarian republic use crowns as symbols of sovereignty. Poland comes to mind, too. Nathan Lamm asked: What are the smokestacks, if that's what they are? These are three towers, each with an ostrich feather on the top. These picture the towers of the citadel of San Marino named Guaita, Cesta and Montale. Each of the towers is, they say, equipped with a metal wane at the top, that is in heraldic interpretation pictured as feather. Compare, e.g. Smith 1982. Nathan Lamm asked: What are the two different branches on the sides? I guess that I can't be that wrong interpreting the branches as laurel and oak. These are usually taken to symbolize glory and (military) strength, and as such found in many Coat of Arms (cf. Portuguese army emblem, Estonian greater arms etc. ).